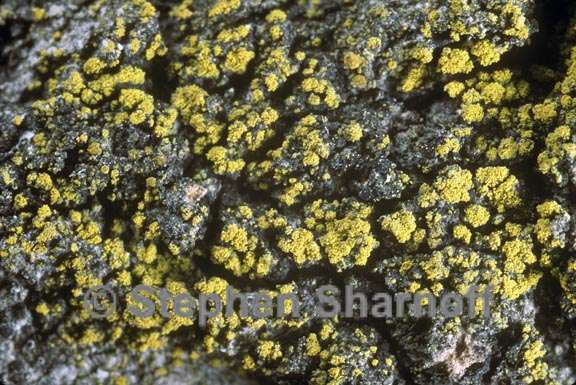 Thallus: crustose, granular to areolate to minutely squamulose, often obscured by the soredia areoles: convex, rounded to elongated, up to 0.4 mm wide, sometimes somewhat raised from the substrate, often dissolved into soredia surface: green to green yellow to yellow, sorediate soredia: yellow, powdery, 0.02-0.05 mm wide, on the margin of the areoles and spreading inwards, forming discrete soralia or coalescing into a continuous sorediate crust Apothecia: not seen in Sonoran material, elsewhere lecanorine, up to 0.75 mm wide disc: darker yellow than the thallus, ±flat margin: thin, entire or sorediate exciple: thin to thick, sometimes visible from the outside epihymenium: yellow-brown hymenium: hyaline, 55-60 µm tall; paraphyses: simple, cylindrical or with weakly swollen, with tips up to 3 µm wide; hypothecium: hyaline asci: clavate, 16-32-spored ascospores: hyaline, simple to 1-septate, oblong to narrowly ellipsoid, 12-15 x 4-5 µm Pycnidia: not seen Spot tests: K- to K+ reddish, KC-, C- Secondary metabolites: calycin, pulvinic acid, and pulvinic dilactone. Substrate and ecology: mostly on the bark of broad-leafed trees World distribution: North America and Europe Sonoran distribution: rare on oak, juniper and on mossy rocks in oak woodlands and mixed conifer forests in Arizona and Sonora up to at least 3000m. Notes: Only sterile specimens of Candelariella efflorescens have been seen from the Sonoran region. These are tentatively identified as C. efflorescens. No material of the likewise sorediate, but 8-spored and morphologically characteristic C. reflexa (Nyl.) Lettau have been found, but possibly another 8-spored sorediate species occur in the region.